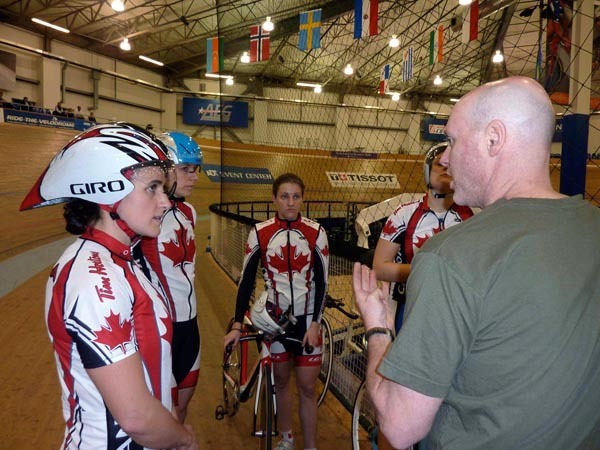 The Canadian Track Team has been coming to Los Angeles almost once a month since September, and the team heading in to the final World Cup in China have noticed that the excitement of previous camps has been replaced by a professionalism and a feeling of getting down to business. Tara Whitten has made the move down to LA, at least until Worlds, to benefit from the quality track, warmer weather, and the new electric bike that can go over 60 km/hr for an hour on a single charge. Electric Coast Cycle modified a dirt bike to accommodate the high performance needs of the track team, and it's getting quite a workout. The sprinters and endurance riders used the moto for most of the latest session and Tara noted that “the Americans, who were training here earlier in the week, are very jealous of our motorbike! It is an invaluable training tool, and we are lucky to have it.” Video of the women training with the electric bike can be seen at www.youtube.com/canadiantrackcycling. The start list for the events in Beijing will be named closer to the start of the races. The team is looking to improve on the gold medal and two silver medals that they brought home from the last World Cup.